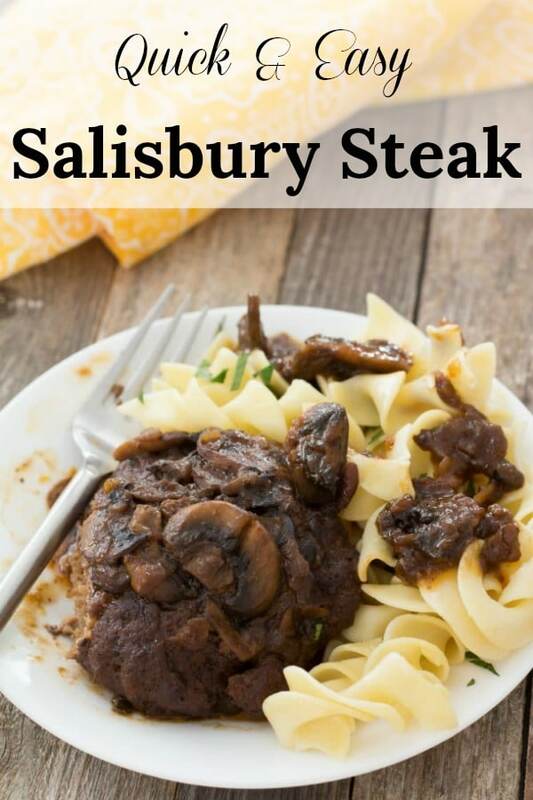 Easy Salisbury Steak Recipe is great for a busy weeknight meal. You can have this one on the table in under 45 minutes. Perfect served with rice, mashed potatoes, or egg noodles. This recipe uses simple ingredients you might already have in the pantry. 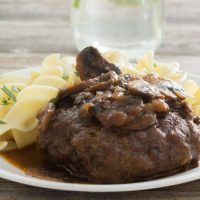 I use condensed French onion soup in my Salisbury steak recipe, but beef broth can just as easily be used. I also use extra onions because I think it adds a little more flavor. If you don’t have condensed soups in the pantry you can always make your own broth using some bouillon cubes. Just watch the salt content in your bouillon cubes. We have talked about this before in other posts, it is hard, if not impossible, to get salt out of a dish once it is in there. 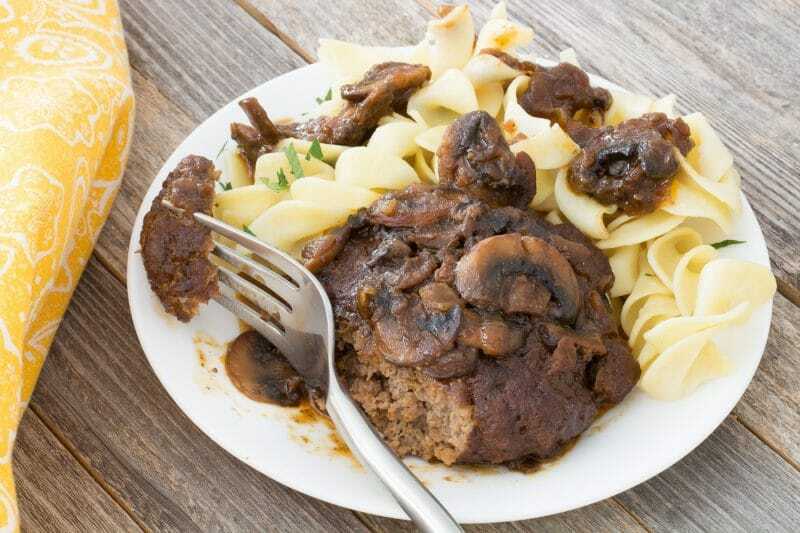 Using mushrooms is also a matter of personal preference. We love mushrooms but I know that there are a lot of kids that just flat out refuse to eat them. Leave them out if you want. It will still be good. Or pull them out of the brown gravy and place them into a separate bowl before adding the beef. 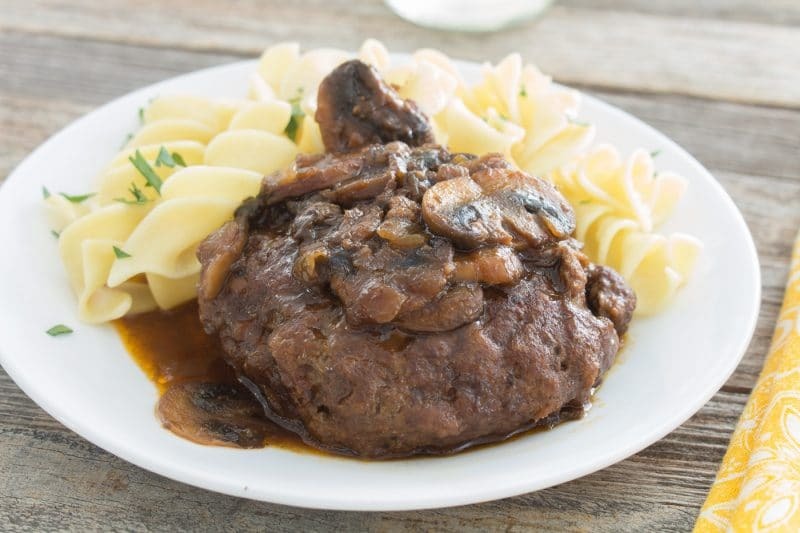 Our Salisbury steak gravy uses the rest of the French onion soup, ketchup, and Worcestershire sauce. It is a bit tangy and we kind of like it that way. Tomato puree would be a great substitute to keep the tomato flavor without the tang of ketchup. 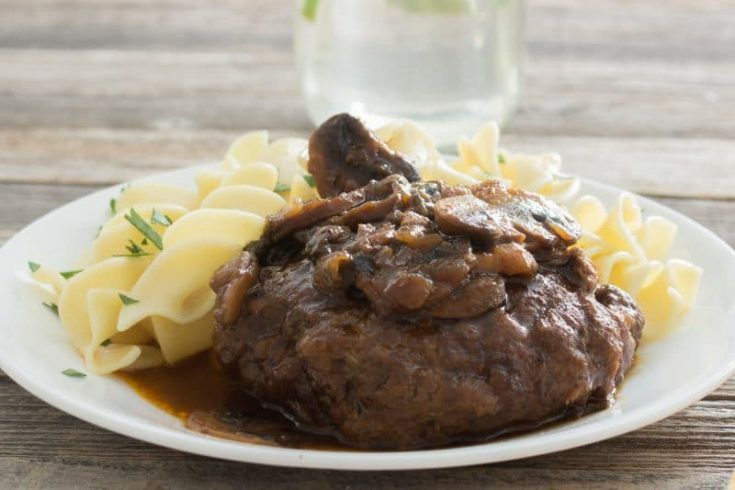 But, always seems like there is a but when I write these post, you can substitute with a brown gravy recipe of your choice or even by yourself a brown gravy or beef gravy packet or two and substitute with that. I would add a touch more water than the package calls for though so that has some moisture for simmering for a bit. This can be served with just about any starch for a complete meal. 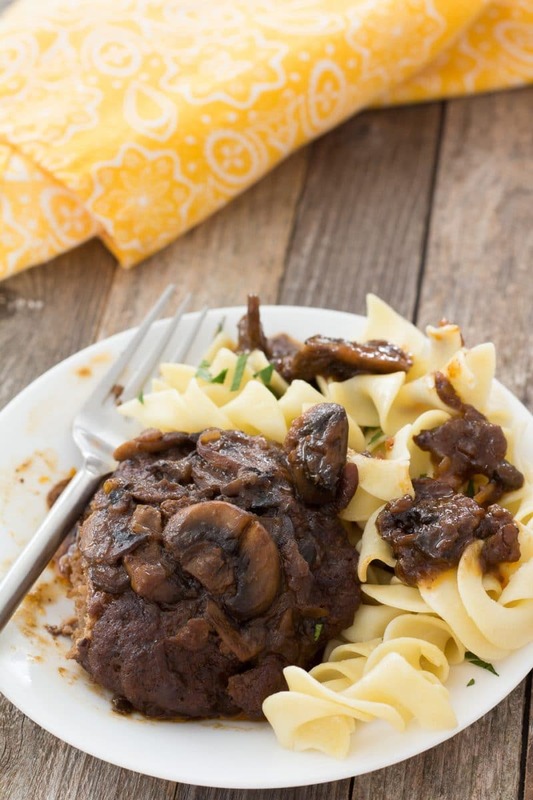 Our favorite way to serve this easy Salisbury steak recipe is to serve it over some buttered egg noodles. I don’t really do anything special to the noodles besides boil them as directed on the package. I drain the noodles well and then toss them back into the hot pan with some butter and sometimes parsley flakes. I have also been known to boil some potatoes and finish them off in the exact same manner and serve buttered potatoes instead. Quick and easy weeknight meal! In a bowl combine ground beef, 1/3 cup French onion soup, bread crumbs and egg. Mix by hand until well mixed. Form into 6 patties. Fry patties the patties in a skillet over medium-high heat until browned on both sides. Patties may still be pink in the middle, they will continue cooking while simmering. Remove to a plate. Leave grease in the pan for cooking onions and mushrooms. Add the onions to the pan and cook stirring frequently until wilted and golden. Add mushrooms to the onions in the hot pan and cook until slightly softened. Combine remaining soup, ketchup, Worcestershire sauce, mustard, and flour. Whisk well to get rid of all flour lumps. Add mixture to mushrooms in the skillet. Reduce heat to low and bring to a simmer. Add beef patties back into pan and spoon gravy over top of the patties. Cover and simmer over low until is liquid thickened, about 30 minutes. Serve with rice, noodles, noodles or mashed potatoes.